I find myself lamenting the passing of the Mac OS install disk. It provided me with peace of mind knowing that I could boot from that disk if something went horribly wrong on my internal drive. I researched how to make a bootable USB thumb drive to replace the optical disks of yesteryear. Finding the instructions was easy enough, but upon reading through the procedure, I found that the amount of dealing the the built in UNIX terminal exceeded my comfort level. A little more digging turned up DiskMaker X.
DiskMaker X puts a graphical interface over the terminal commands needed to produce the bootable drive. 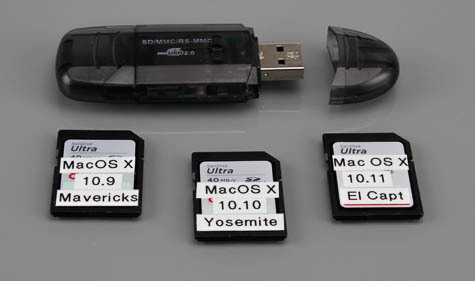 Armed with this donationware and a few new high quality 8 GB Secure Digital cards I was able to create bootable drives for Mac OS X Mavericks, Yosemite, and El Capitan. I am now ready to upgrade or repair the OS on my Macs or those of my friends and family. The road to this Mac OS X nirvana did have a few bumps in it. I first installed DiskMaker X version 5.0.2. I was unable to get this version to make the installers that I desired. Rather than repeated hitting my head against the wall, I set it aside for another day. A few days later I searched again for a graphical solution to my desire to make bootable OS disks. I learned that DiskMaker just published a update to version 5.0.3. A download of this newer version proved to be just what I was seeking. In short order my drives were complete and ready for use. I encourage donations to this developer upon completion of your install disks. I placed an operating system on the fastest Secure Digital card I could buy. The loading time was so slow that I gave the card away. I am sorry that it gave you a slow response time. This would seem to be a problem outside of DiskMaker’s ability to control. It is my understanding that all that DiskMaker is doing is placing a graphical interface on the commands built into Mac OS X.